Our first CSA pick-up 2 weeks ago included a large bunch of chives. 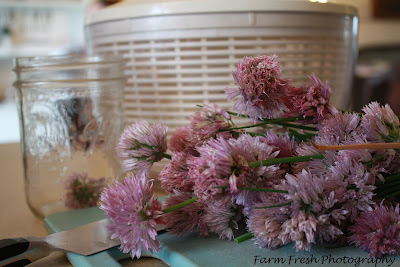 Cut chive blossoms off and wash/spin dry in salad spinner. One pint jar stuffed to the top took all the blossoms I had. I used a white wine vinegar, but if all you have is the plain, ol' white, then just use that! 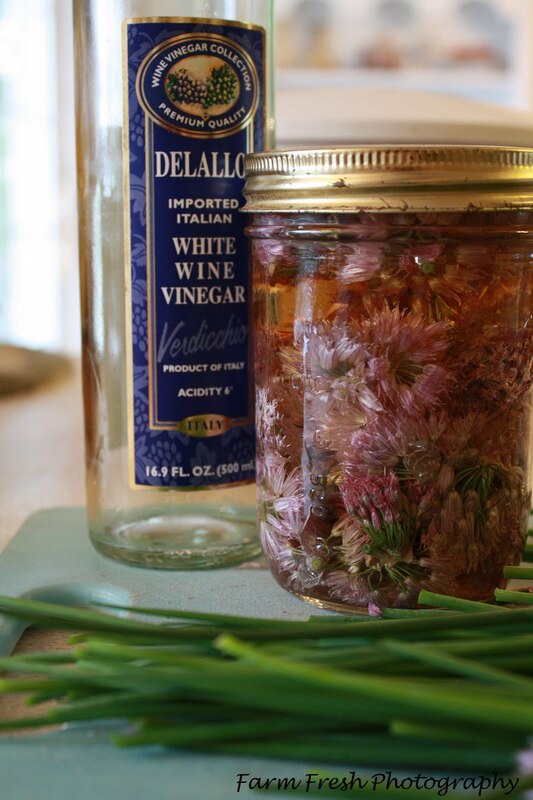 Let set in a cool, dark place for a couple of weeks, then strain out the blossoms for a nice, mild oniony flavored vinegar! Another great recipe from Pam, at "For the Love of Cooking"! I improvised a bit from her recipe, as I do not use a bread machine. Instead I throw everything in my Kitchen Aid standing mixer and "knead" for about 8 minutes. The other change I made was I added the minced garlic directly to the dough as it was mixing, for an even greater garlic flavor. Yeasty, garlicky, basily, and light as a feather. They are on the menu for tonight with some simple. stuffed shells and of course, a HUGE salad! 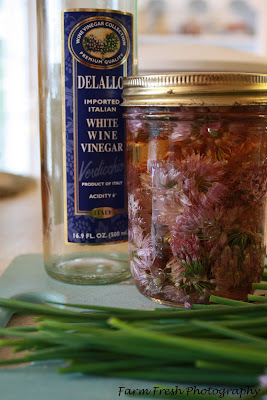 Hmmm....perhaps the vinaigrette will be made with the chive blossom vinegar! How has spring been treating YOU? Spring has been stormy here in Missouri but God is faithful. We missed spring here in California. We went from winter straight into summer. It's still beautiful though! It's HOT here in central Arkansas! I love vinaigrette dressings and marinades! 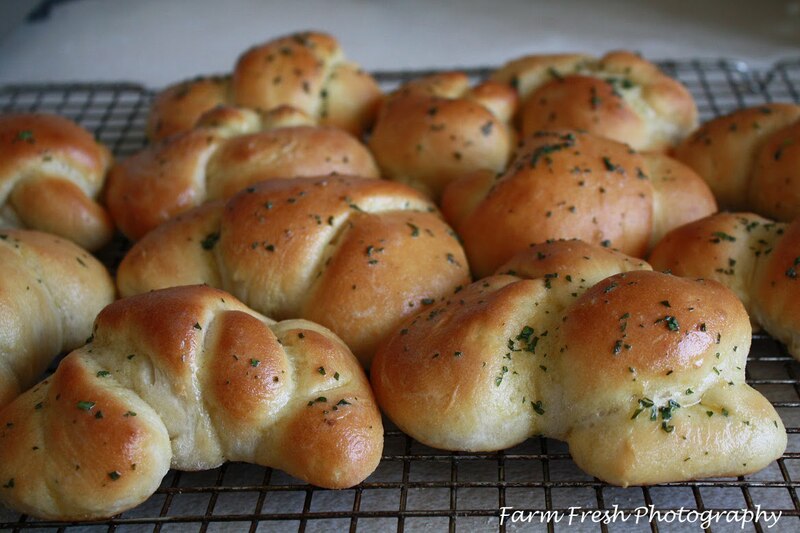 Those garlic knots look amazing--I just may have to try making these! Looks delish! I may have to spend the next rainy day baking some of those. It all looks heavenly! Oh, I do love me some garlicy rolls! That vinegar looks so pretty and of course, I'm sure soooo delicious too Cindy! yummmm I have tons of blossoms too, I will have to give this a try. Those rolls look wonderful too. I never thought of doing this - what a wonderful idea! Mine usually just end up in the compost. What a great idea, and it looks so very pretty!! And those rolls look delicious! I agree with you completely..the beauty of the cross truly shows us how incredible our loving Saviour is! It's smokey here from all the fires. We can't even go outside and the smoke is even in the house now, despite us trying to keep the doors shut! It's making me pray even harder for much needed rain! Those rolls look awesome. I too would add more garlic as our family loves the stuff. I'm definately adding that to my menu! Hi! My chives just flowered. I can't wait to try this. You have some really neat recipes that I never see anywhere else. Yum! I can't bake rolls like yours, but the butter will work on my husbands homemade bread, I think. I just stated blogging yesterday. Please check it out and say "hi". I love chive vinegar. Haven't made it yet this year though because I haven't harvested them from my front yard yet. The garlic knots were dangerously delicious--I couldn't stop eating them! 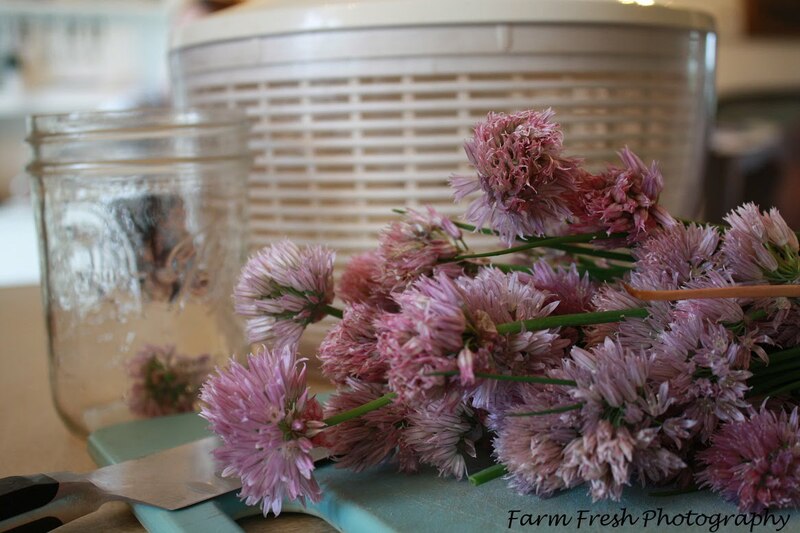 I have plenty of chive blossoms in my garden, so I will try this. My husband's favourite is balsamic vinegar, but I don't know how that will work out because balsamic is such a strong flavour, the chives might be overpowered. We'll see. Our spring here in southern Ontario started off cold and wet, but the rain has moderated now. I don't mind a good rain a couple of times a week, because it saves me watering the garden so much ~smile~. BIG BIG BIG hugs to you..
OH, those rolls look heavenly! Oh wow Cindy my mouth is just watering! thanks for sharing this, This will be on my menu this week!